Productivity is different when you are an entrepreneur. Working for yourself gives you the ultimate freedom and control to schedule your day, but it also makes it just as easy to be unproductive. Unlike other jobs that are highly specialized, being an entrepreneur means that you have to wear many hats. You have to juggle working on your product, serving your clients and managing all the internal operations as well. You provide the leadership and vision of your mission, and you also push every piece from behind too. It is hard to get everything done in a day no matter who you are, but with so little boundaries, it is extremely difficult for self-employed individuals to be productive and achieve work-life balance. Here are a few tips that help me stay productive and balanced. Do what you hate most, first! The idea is pretty simple. Take a look at your to-do list and whatever it is that you hate the most, get that done first so that you don’t stress about it for the rest of the day. Ever since I started doing this, my days are so much easier. I always work on the project I dread the most in the morning so that I don’t have to worry about it any longer than necessary. Then, at the end of the day, when I’m the most tempted to be done with work, I don’t have to force myself to do it and feel much better about my day. Limit how much time you spend on each task! I only work on each client for about an hour a day, and that’s it. This has been great for me. I find that if I work on the same project for hours and hours, I get bored and my mind starts to wander, making it much easier to be productive if I simply limit how much time I spend on each client and task. Not only does this have to do with keeping things interesting, but it also makes me more efficient, in part due to Parkinson's law. Parkinson’s law basically says that a project will take as long as the time it is given. So, if I give myself five hours to work on a client, it will take all five hours to finish that work. But if I only give myself an hour, I can usually get everything that needs to be done, done in that hour. Get out of the house in the morning! As someone who is self-employed and works from home, it can be a challenge to get out of the house. It is so much easier to stay in my pajamas, skip the gym, work from my couch and order delivery. But doing this makes me feel lazy and less productive. I have found that just by getting out of the house in the morning for whatever reason, I feel way more motivated and productive. Plus, it’s good to get some fresh air, sunshine, and interact with people. Sometimes, my morning outing is a trip to the gym; other times I just go sit in a coffee shop to knock out a few tasks. In any case, getting dressed and having a conversation with real people sets my day off right. Take care of your business before your clients! Think about the safety speech at the beginning of every flight. In the event of a drop in cabin pressure, put your own mask on before assisting others. The same idea is important for your business too. it is way too easy to put off tasks that don’t directly benefit your customers, that’s where the money comes from anyway, right? But while clients and customers are important for your business, there are still tasks that need to be done to keep your business afloat and more business coming in. Don’t put them off. When I put off things like social media, my blog, or taxes, they never get done. After a long day of client work, the last thing I want to do is fiddle with taxes. By putting these internal tasks first, I get them done and have a healthier business for it. Leaving behind a 9-5, a lot of people think they will have so much flexibility to sleep in, exercise, cook all their meals, run errands, and of course, work really hard. I’m not saying it can’t be done, but it can go wrong in a couple of different ways. 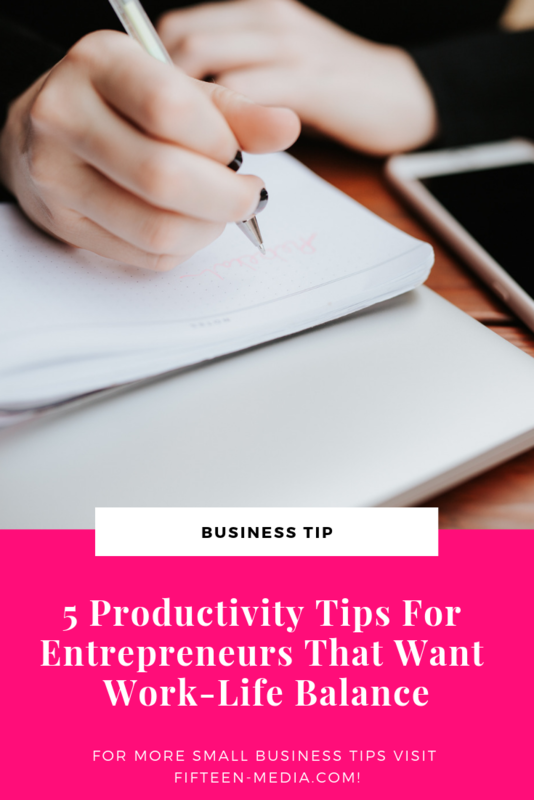 There are times when entrepreneurs find that they finish everything on their personal to-do list, and don’t have enough time for their business. And then there are times when work completely overtakes every minute of the day, leaving personal priorities in the dust. You are the only one in control of your work-life balance. If you want to lead a healthy and productive life and business, you need to schedule that perfect formula in your calendar and stick to it. Even if you work for yourself, you still only have 24 hours in the day. If you are honest with yourself about what is really a priority and make a plan, you can have a productive business and work-life balance at the same time. Is Your Brand Ready for Media Attention?